Sweet Mini Peppers – We Call Him Yes!Chef! I saw these colorful mini sweet peppers at the store the other day and I wanted to photograph them but I had to come up with some sort of recipe so that Yes! Chef! would make them for me and then I could photograph them. Lo and behold there was a perfectly great recipe right on the back of the bag. I brought them home and waved them in front of Yes! Chef! He said something like, “Yes, they are pretty”. He knows my propensity for Crow Photography (photographing any pretty, shiny or colorful thing that I see), so he wasn’t culinarily very interested. Then I showed him the recipe on the back of the bag and I said things like, “Mmmmm. 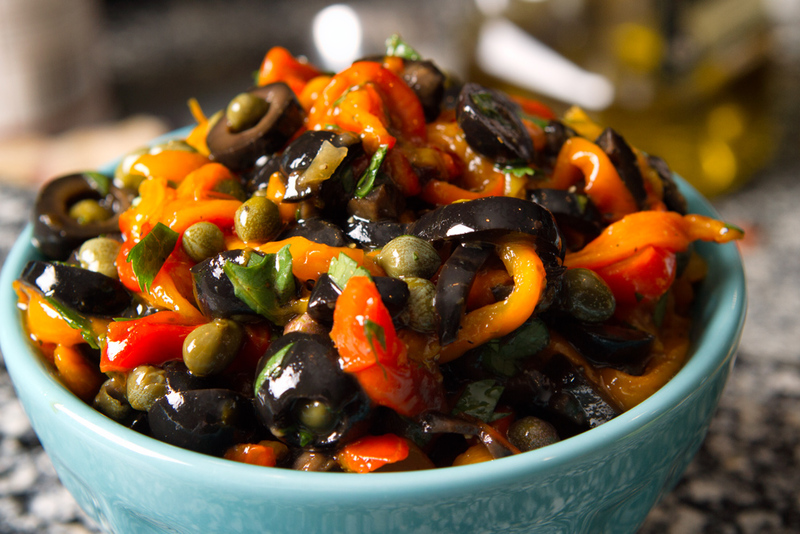 This looks great” and “I sure do love capers, olives and peppers” and finally, “Could you please make this for me and we could put it on steaks tonight.” That did it. First he oiled up the peppers with olive oil and roasted them in the oven. 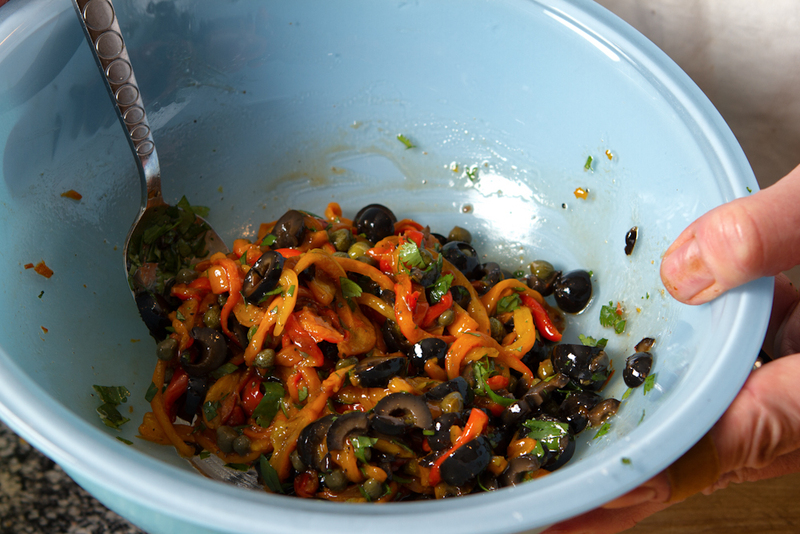 Then he chopped up olives and cilantro, threw in capers (my personal favorite) and added the appropriate oil, vinegar and seasoning. We both tasted and proclaimed it a success. Of course, then I got to photograph it. Finally, he cooked the steaks and I photographed the finished product quickly because it was time to eat! And THAT!, my friends, is what dinner is like around here with Yes! Chef! This looks amazing and is making me hungry! Thanks for sharing and congrats on being Freshly Pressed! This makes me want to fire up the grill tonight! Gotta love food with flavor! LOVE the roasting tip — awesome! I’m a red pepper fiend…odd part is, I HATE bell peppers. Isn’t that random? Gorgeous! I love those sweet and briny flavors, too. Now I just need a Chef around here! Looks soooo yummy !! Geat composition ! I love it! We just had a party and have so many of these beautiful sweet peppers left over. Now I know how to cook them. I love balsamic vinegar and that looks delicious. The last time, I made a creamy mashed potato-bacon stuffing and stuffed each one, putting the little tops back on, and then roasted them in the oven. Thanks for your recipe! I love the idea of using those baby peppers to make salsa! Looks delicious – and now I want that steak! I am sooo making this for dinner tonight. Wow! I use those same mini peppers for salsa all the time. However, I use them without roasting. The salsa is fantastic. Everyone who tries it raves! Try them uncooked sometime with onions, cilantro, a little lemon juice, salt, pepper and garlic. That’s all I can tell you. Or I will be giving my secret salsa away! What a tease! You speak it, you leak it. — the recipe, that is! I enjoy cooking for my family, and peppers are always apart of our nicer meals. 🙂 Thank you, for sharing this recipe. Mmm… delicious, I will try your recept, it look good. I like your blog. Thank you so much. The recipe is quite good although make sure it is at room temperature when you put it on the steak. Otherwise the cold element is not so good with the hot steak. Good advice only if one does not like cold things on steak. . . was raised with cold horseradish, chili sauce, green olive spread, cold sauerkraut, etc., with hot meats. Yum. Looks absolutely aaamazing! 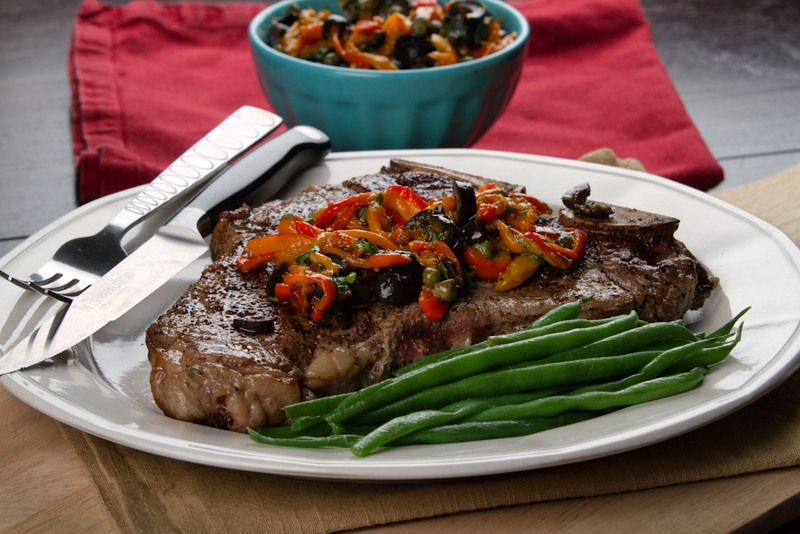 I’m salivating over here 😉 mmm….steak and peppers! I don’t mind, but most people (Of course!) agree with Yes! Chef! That sweet pepper salsa looks fantastic! I’m definitely trying it out next time I have steak; thanks for the idea! This salsa is awesome! I wouldn’t eat it on steak, being a vegetarian….it would be good in vegetarian stuffing! Or just as a side to tender baby greens! You are right! It was very awesome and I must admit that I sneaked a couple of tastes before dinner. The photos are astounding! What camera do you use? By the end of the entry, I had to scroll up to look at the photos again! Thank you so much, Jennifer. I have a Canon 7D. I mostly like to use natural light with a couple of reflectors, but I also use off camera flash. I tend to have preference over natural light too, and only use flash when extremely necessary — but your pepper photos are really amazing! It’s as if I can touch them from my monitor! Thank you. I also use NIK filters, which really help the picture come to life. Also, back light and towards the back light with reflectors in the front of the food really changes the way food looks. Backlight/back sidelight adds lots of depth. That looks amazing, and I’m not usually a big pepper fan! Ha! You won’t regret it. Reblogged this on Dinner Affair Club. Your pictures look good enough to eat! That just looks fantastic. What a beautiful presentation of your recipe. I have grown mini-bell peppers in my garden before, but I was at a loss as to what to make with them. I might give your recipe a try this year. I love olives and capers too, so this seems to be a winner to me. Looks yummy! I am a big caper fan so can’t wait to try this. The recipe will come in handy this summer when I’m trying to use up my peppers from my garden! Great pictures and thanks Yes Chef, for making this! Great blog! Capers are one of my favorite things and so I’m always looking for caper recipes. I’m glad you enjoyed the post. lovely photos and it looks so delicious.. i could almost taste it. congrats on being FP. Thank you. It was quite a surprise. It’s a very simple recipe that anyone can do. I hope you like it! All that’s missing is a bowl of brown rice, perfect for a tedious Friday! in my country the name is: “Manisan”. Manis=sweet. .
Now I’m craving sweet large peppers……perfect! What a delightful recipe (and I didn’t know the brown bag trick) I think I might grow some sweet minis now! The recipe did not call for the brown bag, but it makes it much easier to peel the skin off. I think it would also be good on Crostini with a mild flavored spread cheese. Love your site. Easy on the eyes and comment section is laid out so smoothly; makes one just have to comment! The photos look like you used black olives and not green like the recipe. If that is so, has anyone made it yet with green? Your pictures are stunning! I envision a coffee table book of just your food pics in your future! We did use black olives because our little country store did not have green ones. The recipe did not call for the green olives stuffed with red peppers either…just green olives. So, we used black ones. Your comments on my photography are greatly appreciated. I am still in the learning process. It looks so good! is it hot? No, the peppers are sweet and roasting them brings out even more sweetness. Wow! My husband likes hot peppers so he would probably like it. It looks delicious! I bet it would be nice on toast with houmous! I hadn’t thought of that, but that sounds mighty tasty to me. Is it realysweet sir ? The peppers become sweeter when they are roasted bring out the natural sugar in the vegetable. That must have made salsa for 20! Lovely pictures. Actually, it didn’t make that much salsa. I think it would have probably served four quite comfortably. A very Delicious blog. I could not stop myself having food after reading it. The recipe is also very tasty. Thanks for sharing. You are so right and I need to remember to include more preparations shots in my blog. Thank you for stopping by. Well, it looks so yummy and I’m reblogging this art. Does look fantastically good. Wonder if it would work on fish with another seasoning than vinegar. I’m sure it’s equally fabulous on its own. Also great pictures!!! This looks delicious! I am excited to try the recipe. I have done roasting of pablano peppers for salsa but never just regular peppers. How fun! And I have never heard of the brown paper bag trick. Thanks! I hope you enjoy the recipe. 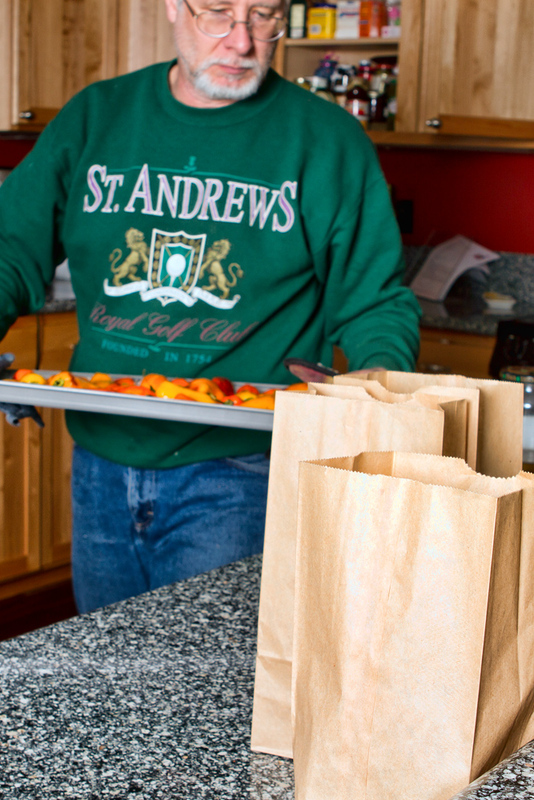 We’ve been doing the brown paper bag trick for years and it works great. Besides the delicious recipe of Mini Peppers, I find your photography very beautiful. I prefer too using more natural light and occasionally adding an off camera flash. Thank you for your inspiration having food photography on your blog, so far I had been hestitate to do that. Thank you for your kind comments. I am still learning how to photograph food. I have taken several classes from Ron Goldman who has helped me tremendously. Thanks for the blog and recipe… I have to try this. I love anything with olives and this looks delicious. Your photography makes me want to dig right in. Thank you so much. You should try the recipe. Funny story. Several people have asked me if they are hot peppers. Yum yummy, I hope that all the other people that are following my weight loss blog will give the salsa a try! Pingback: Breakfast with Yes! Chef! or What to do with leftover breadsticks | We Call Him Yes! Chef! This recipe makes me want to run to my kitchen and cook it. i love the term “crow Photography!” thanks! hahaha…I’m easily distracted, I guess. What a delicious looking post! 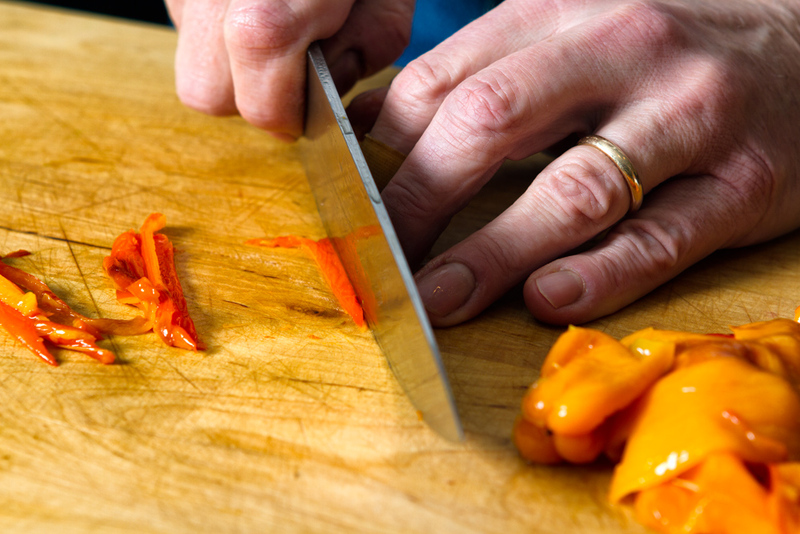 Must be a lot of work skinning all those teensy tiny peppers – but the result looks worth it! What Time is Dinner??? SURPERB!!! Love the great photography!! Keep up the good work. I often buy those little peppers. I can’t resist because they’re adorable. We eat them raw, roasted, stir fried….you name it. They are great and so is your photography. Thanks for sharing! Congratulations on being Freshly Pressed. I love those sweet little peppers. For some reason I can only find them at Walmart and Sam’s. I grab them every time I go. I think I found them at Safeway, which is the same as Vons if you have those G stores. Thanks for stopping by. I have been started to build a review on food press on http://www.techietalk.in ,I should enter this in my blog. Thanks , this Sunday ,I will make the mini sala @ my home. You are certainly welcome. Hope you like. Very interesting story. I might have to tell Chef about frying peppers! Very, very nice, but then for me the simple things in life are always the best. Thank you so much, Kate. And to you. 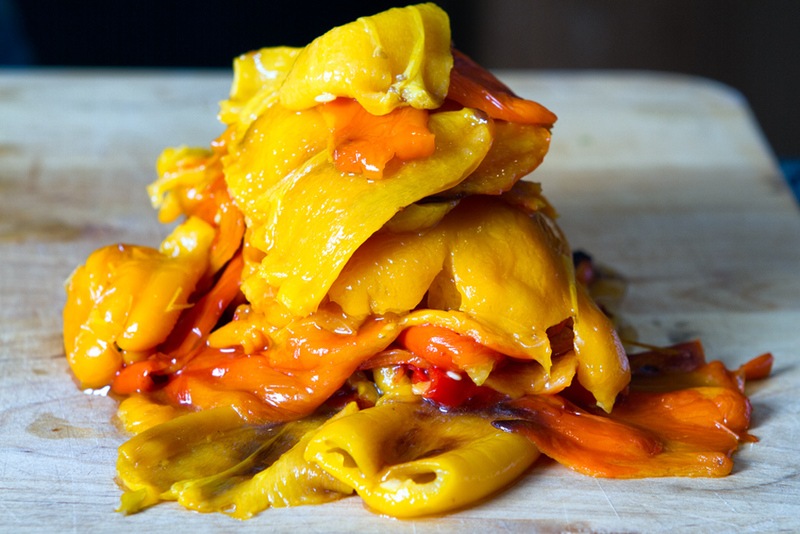 OK, SHOULD we warn the un-suspecting people about peppers …. ? OIL is for your HANDS ….. keeps out the capsaicin. Those ‘sweet peppers’ look like several other peppers which are HOT. Personally? I love hot. But, I always tone it down for others. Thanks, Wayne. 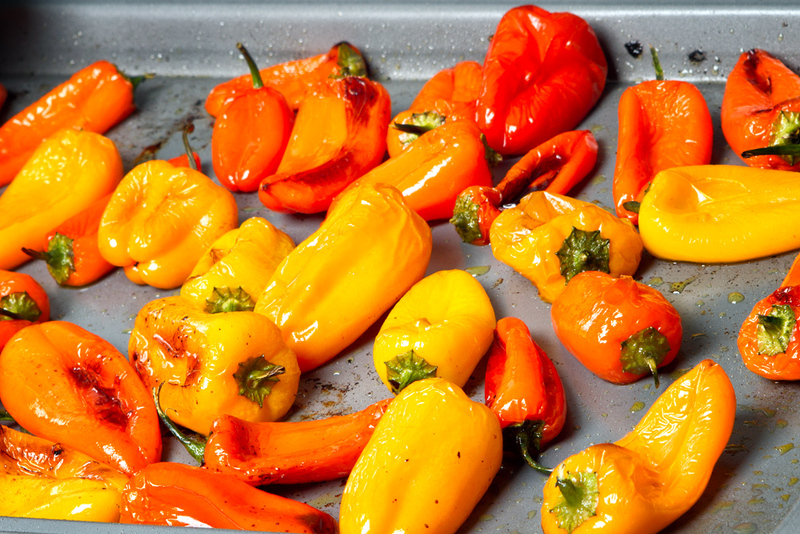 This recipe is definitely designed for sweet peppers. Hopefully, people won’t get confused. This is a very creative blog. I really like blogs on food, but also, I don’t like them, because they make me want to eat the illustrations. Thank you so much. My husband is a very creative guy. I can see that. This site is the best! I think he could make websites as well as blogs. he would be interested to hear that since he doesn’t know too much about blogging or really anything about the web except he likes to search for recipes. He rarely gets on Facebook. Oddly enough, I’m the one that made the blog site. I like design as well as photography. Thank you for stopping by and your kind words. Not only pretty to picture! But they look delicious! The steak looked yummylishous, too. How’d he cook it? I might have to give this a try one day. Soon. Wow it just wanna have this for dinner! It’s awesome. Craving for some steak and peppers now. Looks gook! Love your photos! I don’t care for olives so this isn’t a recipe for me, but it looks gorgeous. Thank you so much. You could probably leave out the olives for this. I wouldn’t leave out the capers, though. Beautiful pics and a great looking recipe; will have to give it a try! Beautiful photos of creation of mini pepper salsa. And Yes! Chef! is amazing. I can’t wait to make this exactly as shown. Thanks for sharing! I’m so happy I came across this…we’re going to try to do a variation and include some tomatoes as a sauce with pasta, or as a topping for some grilled salmon. Haven’t decided yet, but thank you for sharing. And your photos are stunning – they really bring the food to life! Thank you so much! I think this salsa would be good on salmon. It’s making me hungry thinking about it. Lovely recipe, lovely photographs! I’m definitely going to try this. Such beautiful photography! And I think I could eat a whole bowl of just the salsa. I guess I could eat a good chunk of the steak too, what the heck. Very nice supper! You gave me a chuckle. The steak was sooo good, but too much for one person. We usually split it between us and give the dog a bite or two, also. I’m so glad I found your blog! I’ll be back! Great photos!!! 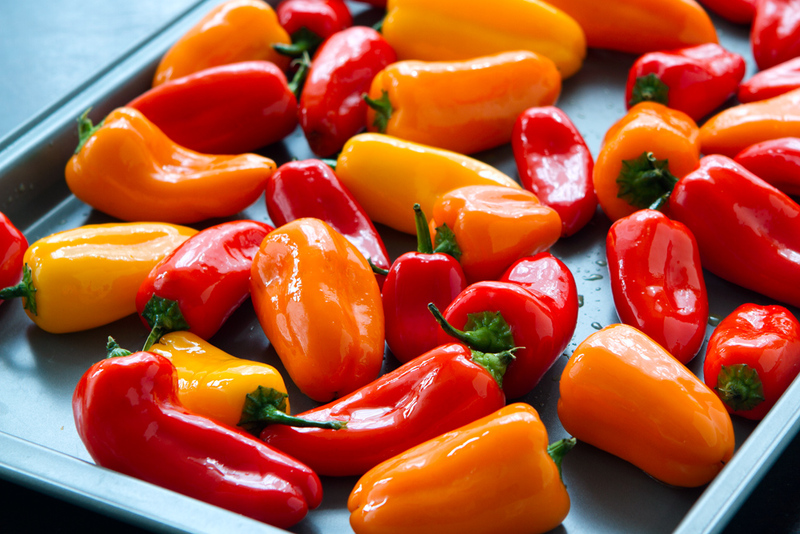 These look absolutely divine and the close-up photography makes the stunning colours of the peppers look so vivid. I am a huge fan of peppers and often eat them with couscous. Beautiful presentation, I’m, loving the bright colors. Wishing I was there to taste this appetizing meal! Looks so delicious! And great photo’s! I think I may be whipping myself up an interesting dinner! Looks delicious, making me hungry just reading the recipe and looking at the fantastic photos! That looks so delicious! I love roasted bell peppers with beef (tri-tip and roast beef are also good) but I’ve never made a salsa with them. That would be a really tasty variation. My family is Italian and we grill most of our meals during the summer, so whenever I’m at my parents’ house we usually have grilled peppers, onions, eggplant, and zucchini with our meat. I’ll be planting peppers in my garden this year, so hopefully I’ll get enough to try a pepper salsa like this! One of the other comments mentioned Italian pepper sandwiches … I haven’t had one of those in years! I’ll have to start making them. I know! I’m excited to try a pepper sandwich, too. With crusty sourdough bread. Yum! Nice to have someone who understands. Beautiful photos! The recipe execution looks fabulous. I must be channeling after sweet bell peppers as 1) I just bought a bag of six at Sam’s and 2) this is the 6 blog read I’ve come across in the last two days featuring them. Your ‘crow’ eye did wonderfully well with these! hahaha…I hope you enjoy them. That looks very good but not particularly Weight Watchers friendly. I’ll have to make for a special meal. Thanks. I too am a student of crow photography lol. Recipe looks great! Congrats on being freshly pressed! Hahaha…at last somebody knows what I’m talking about! I love fresh ingredients like this! yum! Can’t wait to try! Absolutely gorgeous shots! Glad you were fresh pressed so I could find you. I love sweet mini peppers… I used to buy them at trader Joes every week. I am hoping when the season comes I will be able to find them at my local organic market. My blog is about strictly seasonal eating and I am now living in Belgium so no more Trader Joes… But your shots were so great I can still taste them! Thank you and I will stop by your blog. I love Trader Joes too but the nearest one to me is one hour away. I like to make a weekly trip there and also stop at Whole Foods, which is close to TJ. This looks delicious – and such stunning photos. Thanks for sharing! I’ve got to wait an hour for my lunch and reading this is making me very hungry! Looks yummy. Here the sun is not even up yet and I am thinking of coffee. Enjoy your lunch. I believe that it must be very very delicious. Thanks for sharing. This looks amazing – love the pictures with it. Can’t wait to try. what is the best about this post? the pictures? the flavour? the colors? the taste? the sequence? I am so confused. made my day….i think that shud suffice! Beautiful pics with impeccable composition and all of my favorite ingredients! Thank you so much. I will definitely stop by your blog! The peppers look fabulous! I love using fresh colorful peppers! and your photographs are amazing! Thank you so much. I think color goes a long way towards feeding my Crow Photography inclinations. Just finished my yummy ribeye with your mini pepper salsa recipe. WOW! So good. Perfect meal. Thanks for the recipe. Great presentation. Now that I have practiced on hubby – I will make this recipe for guest. 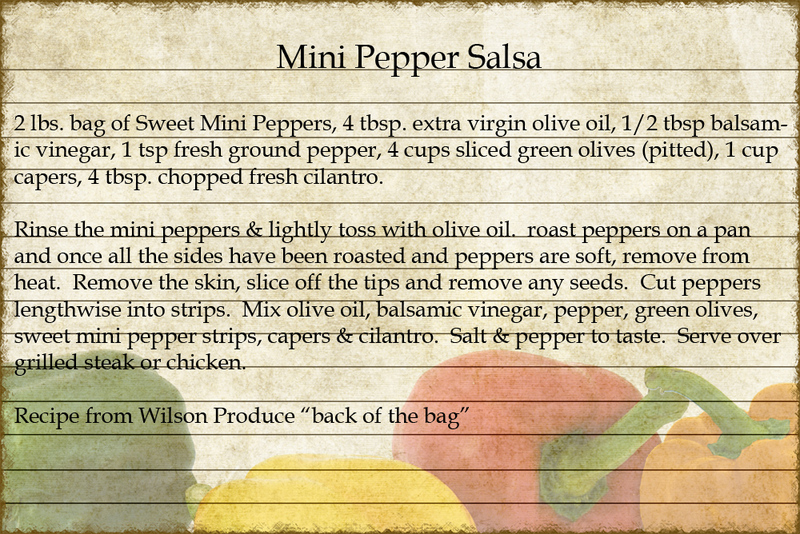 I still have a ton of these minipeppers left – they are great as a snack. Thank you so much for your kind words and for stopping by. I’m glad you enjoyed the recipe! We loved it. Well…my husband is such a great cook that I really struggle with my weight. But, thank you for your comments. Pingback: Spicy Red Chicken Posole in a Crock or What to Eat While You Are Planning a Wedding | We Call Him Yes! Chef! I buy those peppers at every grocery trip and use them in everything. They are also good all by their- sweet- little- crunchy- selves. Yes, they are. I love them in my salads.